Uber on Wednesday launched a groundbreaking driver-less car service, jumping ahead of Detroit auto giants and Silicon Valley rivals with technology that could revolutionize transportation. In an ambitious experiment, a fleet of cars laden with lasers, cameras and other sensors, but with no one’s hands on the wheel were to be deployed by the web-based ride service on the challenging roads of Pittsburgh, Pennsylvania, steering themselves to pick up regular Uber passengers who are used to being fetched by cars driven by humans. Four of the Ford Fusion hybrids with their ungainly rooftop load of technology will be deployed to a select customers on Wednesday, with the company showing at least a dozen more ready to put on the streets. And Uber is well-advanced in developing a self-drive car with Sweden’s Volvo, expected to become the mainstay of the program in the near future. The cars and their backing technology have been trained on the city’s complicated grid for less than two years, but demonstration rides ahead of the launch showed them very able to handle most situations as able as many drivers. Still, just to be sure, the Pittsburgh Uber regulars who summon a driver-less car will also get two company technicians with them to make sure everything goes right. One will sit behind the wheel, with hands at the ready to take over in sticky spots, while the other monitors the car’s behaviour. Uber will not give a timeline, but it aims to reduce that to one technician, still behind the wheel, to intervene and to satisfy existing state policies that require a driver in a car. The goal, Uber officials say, is to get to zero interventions, and no technician along for the ride. The move has put Uber ahead of the rest of the auto industry in getting such cars out for the general public. The major automakers all have driver-less car development programs, as do tech giants Google and Apple. And many automakers already have cars on the road with advanced driver assist technology, most notably Tesla. Indeed, Uber itself was beaten to the punch at launching the first driver-less call service by the Singapore startup nuTonomy, which put six cars on the road at the end of August. But the Singapore experiment is so far limited to a smallish area on the very flat, well-planned Southeast Asia island. Uber’s landscape is the whole of Pittsburgh, a major US city with very steep hills, old narrow streets and multiple bridges and highways built through the middle. What allowed Uber to get to the front of the pack was not auto engineering but rather its ability to accumulate and crunch massive amounts of data on road and driving conditions collected from the billions of miles driven by Uber drivers. “We have one of the strongest self-driving engineering groups in the world, as well as the experience that comes from running a ride-sharing and delivery network in hundreds of cities,” said Uber founder and chief executive Travis Kalanick in a blog post on Wednesday. The introduction of driverless cars challenges the image of what Uber has become: an app-based service of the “gig economy” that gave millions of car owners around the world the chance to make money ferrying passengers without taxicab licenses or other permissions. But Uber’s vision suggests a world of taxis on call by app with no drivers at all. 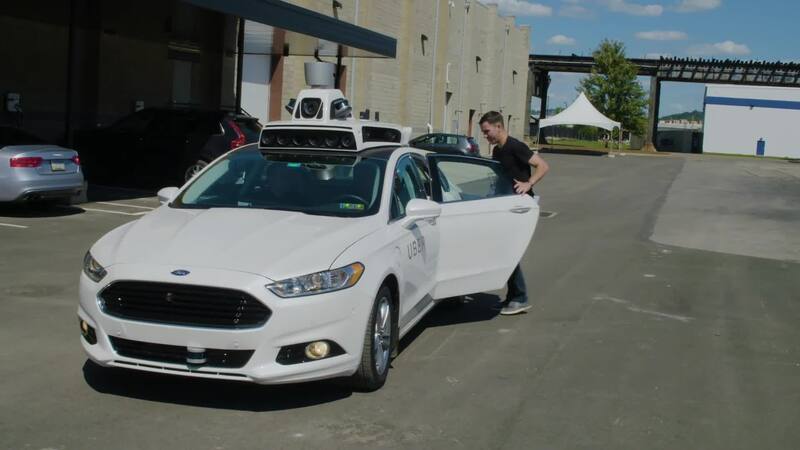 “Self-driving is core to Uber’s mission,” Anthony Levandowski, Uber’s vice president of engineering. That would be far away, Uber officials stress. They still expect over the long time, a mix of cars with and without drivers on the road. Levandowski came to Uber when it took over his own startup Otto, which was developing self-driving technology for commercial trucks. The company now has six driver-less trucks being tested on California roads. Kalanick says the main aim is to create safer roads. “Self-driving Ubers have enormous potential to further our mission and improve society: reducing the number of traffic accidents, which today kill 1.3 million people a year; freeing up the 20 percent of space in cities currently used to park the world’s billion plus cars; and cutting congestion, which wastes trillions of hours every year,” he said. So far, company officials say, they have not experienced any accidents. But they have trained the cars’ minders on how to respond if it happens, which they say is inevitable. Next articleSell Off NLNG, Other Assets And Nigeria Will Be Out Of Recession-Dangote Tells Buhari.